In the 1880s early electrical pioneers had to figure out how to charge customers and build a stable economic system to help keep the electric power industry from failing to its competitors. The established providers of light at the time were gas companies and it was debatable at the time if electricity could be made cheaper than gas energy. Thomas Edison was one of the first to have the urgent need to solve the problem of charging customers as he developed the Pearl Street station in Manhattan. Unlike previous electrical installations which were just one factory or one wealthy mansion with its own power station, Edison had many customers on one circuit. So how could he tell who was using more power? 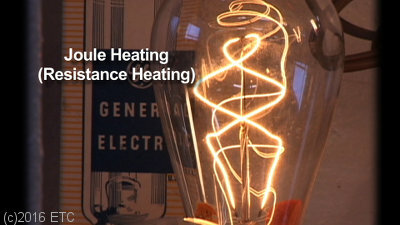 Joule Heating was one way to figure out how much power was being generated. A certain amount of power would light a certain number of bulbs at a given brightness. William Stanley used this method to prove to George Westinghouse that his transformers worked in the Great Barrington AC power experiment in 1886. In that case he proved the change in voltage by using an array of lightbulbs. Meanwhile in New York Thomas Edison used two systems before the watt-hour meter. First he charged customers by the number of light sockets they had in their house or business. The result was customers (like JP Morgan) leaving their lights on at offices all night long without care, meanwhile Edison had to keep paying for coal to be thrown in the boilers. Next he used electro-chemical methods. By observing how much material migrated from one electrode to another in an electrolytic cell he could calculate the amount of electricity used. This was difficult to implement, inaccurate and eventually he bought watt-hour meters from others. 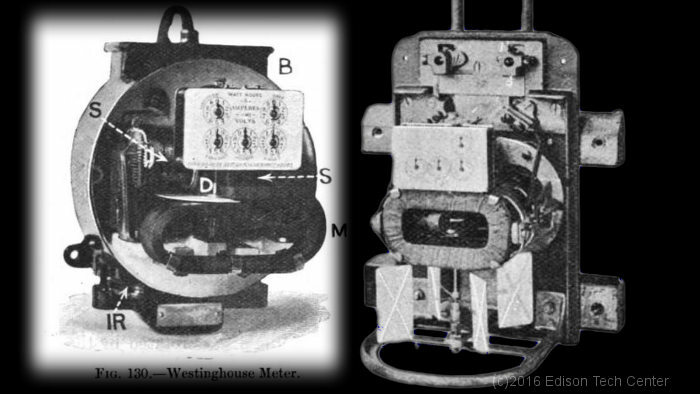 Shallenberger at Westinghouse figured out how to build the world’s first accurate watt hour meter. 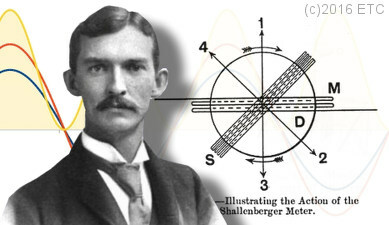 1888: It was Oliver Shallenberger at Westinghouse who developed the first practical modern Watt hour meter, basing his invention off of Weston and Thomson’s moving coil galvanometer instruments. 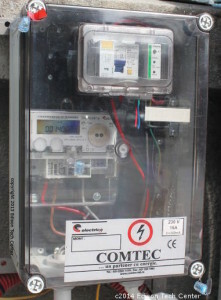 A modern digital watt hour meter in Europe. 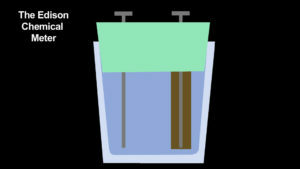 Read more about the Shallenberger meter from this great article by Zach Hughes. Today’s modern “can” shaped meters are based on Shallenberger’s work and are found around the world. In the last two decades the magnetic based watt-hour meter is being replaced by new digital meters. A few new digital watt-hour meters along with smart meters and breaker boxes at Hudson Valley Community Collage where they educate technicians who have to work with smart grid technology. Next let’s look at the other major instrument in this unit, the voltmeter.